When I went away to college, I would stay up pretty late. As any college student can attest to, this is not unusual. When I would be cramming for mid-terms or making flashcards, I would always have the television on. To this day, I still need to have some sort of background noise in order to work (as I’m typing this, I’m also watching The House Bunny). And one of the shows that aired late at night in re-runs was Scrubs. I don’t remember watching much of the show before college, but during my first few years, this was a staple every night for me. As I prepared for bed, I watched whichever episodes were on, laughing the entire time. Looking back on it, Scrubs remains one of the most criminally underrated and underappreciated comedies of our time. It was witty and silly, but could be extremely profound and even heartbreaking. It’s a show that everyone will get something out of, and I can never recommend it highly enough. In the spirit of celebrating Scrubs, I decided to rank the show’s ten best episodes. There are a lot more than ten that I could have chosen, and the ones on here are a blend of the powerful and the hilarious (and also the groundbreaking). What made my cut? Let’s find out! Who doesn’t love a great wedding episode, right? Especially one as hijinks and shenanigan-filled as “My Best Friend’s Wedding.” And what’s so inventive is that technically Turk and Carla don’t even get married until the final few moments of the episode. Because of a series of mishaps (mostly due to the fact that Turk was in surgery and late to his own wedding), the pair lost their venue. The band got food poisoning, Elliot messed up Carla’s sister’s eyebrow, and J.D. spent the better part of the episode trying to get Elliot to forgive him. In the scope of television, this episode isn’t necessarily anything extremely special. It’s not hailed as one of the best wedding episodes of all-time, but it’s special because it is an example of how Scrubs used their actors’ humor and emotional nuances so well. J.D. spends most of the episode acting frantic and silly — something that Zach Braff absolutely perfected throughout the years. Donald Faison’s Turk has the chance to flex his physical comedy, while Sarah Chalke’s hilarious facial expressions were on display. But if there was one stand-out in this episode, it was Judy Reyes, whose comedic scenes were absolutely on-point for anyone who has ever been involved in a wedding. It is her emotional scene, however, with John C. McGinley that really stands out to me. This episode is definitely a great example of how television shows can unexpectedly flip the “wedding episode” trope on its head and make it even better than it was before. I love when television characters get the chance to reminisce on their pasts. In this episode, J.D. asks everyone to think about their greatest moment in medicine. In spite of the fact that no one wants to actually listen to J.D.’s ideas, they all DO think of their particular moments. And honestly, they’re all pretty selfish, surface-level moments involving how being a doctor got THEM something in return — whether a pony or a victory or a day off sipping tropical drinks. But, as J.D. says at the end of this episode, it’s amazing how one patient can impact so many people. Because the beauty of “My Best Moment” is the shared experience between J.D., Carla, Turk, Elliot, Kelso, and Dr. Cox. Each one of them is impacted by the life and struggle of a patient and his son. And each has the chance to re-write that “best moment as a doctor” answer: and they do. There’s a beautiful montage at the end where each character recounts their story of his impact on their lives to other people. And you know that this moment — this particular shared experience — is the very thing that will stay with them for a long time. That’s what Scrubs was: it was a show about shared experiences and character growth. J.D. becomes more focused, Elliot, Turk, and Kelso become more compassionate, Carla becomes more respected, and Dr. Cox becomes more confident in J.D. as a doctor and learns to lessen the reins. “My Best Moment” is such an amazing and often underrated episode that highlights what it used to mean for each of these people to be a doctor or a nurse, and what it means after the episode ends. If you haven’t ever watched Scrubs and you plan on doing so, you need to know exactly two things: 1) This show will be crazier and more adventurous than you could ever imagine. There will be jokes aplenty and meta humor, plus daydream sequences and silly nicknames. And 2) this show will make you cry harder than any other comedy you watch. “My Long Goodbye” is one episode that falls into the latter category. As the team at Sacred Heart prepares their goodbyes to Laverne — a nurse at the hospital and beloved friend — who will be taken off life support after a tragic accident, Carla delays the process. She’s the last to say goodbye to her friend, and she desperately tries not to because she’s not ready to let go yet. But in the most heartbreaking scene in the episode (and trust me, there were so many), Carla finally decides that it’s time to say goodbye. And shortly thereafter, Laverne passes away. The entire team gathers together afterward for drinks and to remember Laverne, and if you weren’t already crying by this point then The Janitor buying everyone their drinks would do it for you. Honestly, this is one of those oft-mentioned episodes of Scrubs because it’s just so utterly sad and yet brilliant. 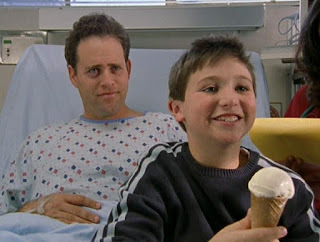 This comedy had the unique ability to make you laugh one moment and sob the next. No other show that I know of — except maybe How I Met Your Mother — has ever come close in perfecting the balance between silly and sad. I doubt any other show will. The best thing about this show was how absolutely crazy it could be. This entire episode, for the most part, takes place in J.D.’s imagination (not uncommon for the show, of course), and is a carefully-constructed multi-cam sitcom. Why does the entire episode play out like a really cheesy comedy with a studio audience? Because that is the way that J.D. can cope with the tragedy and heartache and really difficult stuff happening around him. Scrubs was always a show that went for broke — they didn’t care how zany or wacky their characters acted; they were unafraid to make everything as wild and adventurous as possible. But what the show really excelled at — and what makes it so beloved in my book is — the emotional steamroller they would generally decimate their audience’s hearts with. This was a show all about humanity, and that included the realities of life and death. It was difficult to see our characters break down, and really hard to watch them suffer. But they did. Because that was the nature of their job, and the show never shied away from that. “My Life in Four Cameras” was such a perfect example of the escapism that Scrubs itself provided for people (#meta) and how the characters we loved in the show also needed to occasionally escape. The only way J.D. can cope with the loss of his patient is through pretending his life is a multi-cam TV comedy that has a neat, resolved ending. But life isn’t always neat and resolved, and the show snaps us back to that sobering reality. And that’s precisely why this episode is one of the show’s best. This is one of those episodes that’s completely and totally underrated. Not enough people talk about it, probably because it falls during that horrible period of time known as the 2007-2008 writers’ strike. So while technically “My Princess” should have aired earlier in the season, it was actually rearranged to be the season’s finale. And honestly, this episode is one of the most perfect depictions of what the show was like during its run. It perfectly encapsulates the tone and impact of the characters and their environment. There is heartbreak when the episode’s real characters realize that it’ll take nothing short of a miracle to save their patient, but there is hope in the fairytale version. And when Jordan asks whether the patient really lived, Dr. Cox sticks by his fairytale, choosing to believe that the maiden of the story survived. 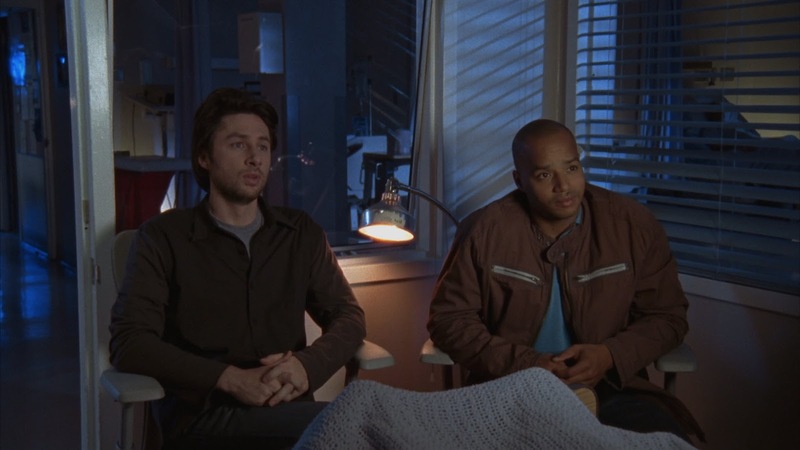 It’s absolutely a beautiful way for the characters to cope with their lives, but also a perfect depiction of Scrubs itself — a show that walked a tightrope-like balance of tragedy and hope. This is one of those Scrubs episodes that sucker punches you because of how brilliant it is and how amazing it is for misleading you. Throughout the entirety of the episode, we believe that Ben is present alongside Dr. Cox as he goes about his day. And we see little fragments of reality poke through, even then — with J.D.’s concern and Elliot’s lack of patience. There’s not a whole lot, however, to suggest that things in the episode are amiss. Because at the end of the episode, Dr. Cox and J.D. walk through a graveyard to Ben’s funeral. And this reveal was just as brilliant as it was heartbreaking. Because you, as an audience member, finally understand that while J.D. crafts scenarios in his head and silly visions in order to cope with the everyday, so does Dr. Cox. He is grieving the loss of Ben and makes up the idea of a birthday party for his son Jack in his head in order to deal with his pain. The episode ends with brilliant music and an extremely rare glimpse at how emotional Dr. Cox could be. He sits at the graveside, crying as the funeral takes place. And honestly, we all cried with him. Because we want so desperately for these characters to have stories that end happily because they spend most of their days warding off death. It’s startling to see them grieve and let down their guards. But it’s also amazing in how unexpected it is. Scrubs was never afraid to take a chance and believe in its characters. I’m so glad that it did. Sometimes the best episodes of Scrubs are the quiet ones. The show knew how to be serious. It knew how to be heartbreaking. It knew how to be absolutely off-the-wall bonkers. But it also knew how to be subtle and quiet, and that’s something a lot of comedies could learn from today. Nothing about this episode was particularly remarkable – instead of celebrating a decades-old tradition of going to a steakhouse together, Turk and J.D. decide to spend the night with a terminally ill patient. They learn more about him and about themselves, trying to walk the patient — Robert — through steps in order to make him the most comfortable he can be. But what that night reveals is the fact that for all of their waxing poetic about the simplicity of dying, they’re actually all really scared to die. J.D. notes, beautifully, that they have to pretend they’re not afraid. If they are — if they show any fear — then death wins and has an upper hand. This is the thing that comforts Robert: honesty. I love this episode. I love it because it’s an episode focused pretty much solely on Turk and J.D. and we all know how well Donald Faison and Zach Braff work together, comedically and emotionally. And J.D.’s voiceover narration about making your last thought a good one continues to be one of my favorite things ever said on this show. Though “My Last Words” is not a grand episode, it certainly is a great one. Have you ever watched a season finale and thought: “This is the perfect way to end this show”? That’s what “My Finale” was for Scrubs (... until the show was renewed for another season on ABC, but we don’t talk about Scrubs 2.0, even if it did have Dave Franco and Eliza Coupe in it, shhhhh). Everything that was right and good in this show was highlighted in “My Finale,” and storylines were resolved in the most believable and satisfying way possible. But the highlight, of course (and the constant highlight for me) of this episode is the final scene, in which J.D. imagines what his future will look like. On the way toward his future, however, he says goodbye to his past — and that means walking down the hallway of Sacred Heart one last time, with friends and patients (both dead and living) sending him off with their blessing and encouragement. If that isn’t enough to get you crying — which it did for me — then the next scene in which J.D. watches his life with Elliot unfold on a giant screen would be as “The Book of Love” played over the scene. And if, somehow, even that wasn’t enough to irritate your tear ducts, perhaps remembering everything that the series was about would. This was a show that delighted in the silly and the absurd, but also depicted the startlingly real world of a hospital and its staff. It’s been hailed by many of those in the profession as the most true-to-life medical series ever, and I think that’s really quite telling of Scrubs. This was a show that was unafraid to make us cry, and unashamed to forgo taking itself too seriously. In short, the finale was perfect. True to the spirit of musicals, Scrubs featured an array of numbers, most with choreography, and made sure to represent as many genres as possible. It paid homage to musicals that came before it (shout out to the Les Miserables and Rent ones in particular), and it did it all while still being absolutely funny, poignant, and character-progressing. Because in order for a musical episode to work — especially on a show like Scrubs that did not feature a musical number each week like a show such as Glee — it has to be rooted in substance. And while the primary plot device of the episode is figuring out what’s wrong with Patti, the musical construct also allows Elliot to navigate how to tell J.D. that she doesn’t want to live with him and Carla trying to tell Turk that she wants to come back to work as a nurse. It is brilliant that “My Musical” functions as such a solid, wonderful episode and yet it’s something of a genre-break for the already genre-breaking series. If this episode is proof of anything, it is that a show should build its foundation on its characters first, and use them to drive stories. The musical isn’t a crutch and it doesn’t serve as a hindrance. Instead, because Scrubs built the foundation of the episode on the characters and their emotions, “My Musical” stands the test of time as one of the best episodes of the entire series. Because “My Lunch” deserves all of the awards. It’s an episode that feels familiar in its humor, but resonates most strongly because of the emotional foundation. On his lunch break, J.D. meets a former patient at the supermarket — Jill — and does all he can to avoid her because she’s irritating. Jill has a lot of issues and is depressed, and J.D. is just another person choosing to ignore her. So when she shows up at the hospital later on, brain dead from an apparent overdose, J.D. feels the guilt of his avoidance weigh down on him. And the one person to take notice is the one person who we least expect: Dr. Cox. Over lunch, Dr. Cox tells J.D. that the moment he starts blaming himself for deaths that aren’t his fault is the moment he will begin to slide down an extremely slippery slope. Other doctors have been permanently messed up, and Dr. Cox refuses to see J.D. follow the same path. It’s exactly what J.D. needs to hear. Guilt is something that is touched upon a bit in Scrubs, because of the fact that this is a show about life and death. Doctors feel guilty for not having done enough to save their patients. But guilt isn’t helpful. It’s the kind of thing that will wreck a person. And at the end of the episode, when the tables are flipped and Dr. Cox begins to slide down that slope, J.D. is the one to pull him out. ... Or, at least he tries. Dr. Cox’s guilt for using Jill’s organs (later found out to be rabies-infected) on transplant patients, including one he was close to, is palpable and painful. John C. McGinley delivers one of the best performances he ever has on this show (as “How to Save a Life” plays over the scene) in this moment. His anger and guilt and pain is real, and we see tears sliding down his face — a rarity for the usual-sarcastic doctor — as J.D. confronts him about walking away because of guilt. And in spite of his best efforts, the pain of it all is too much. Dr. Cox walks away. And that’s how the season ends. “My Fallen Idol” picks up after the events of the finale and is just as stellar in terms of the Dr. Cox/J.D. dynamic. Braff and McGinley had this amazing rapport and chemistry, comedically. But it is in these two episodes that their dramatic chemistry really shines. McGinley has never been better than he was in this arc, nor has Braff. The “My Lunch” and “My Fallen Idol” arc are absolutely beautiful and brilliant, and will never fail to make me cry. That’s why they’re the best. Did you love Scrubs, too? Hit up the comments below and let me know your favorite episodes!